Got an itchy nose when you are in the dental chair? Have you felt itchy and red on your cheeks when you last visited your dental professional? You might be hypersensitive or have latex allergies. The reactions are most likely from powdered latex gloves. In recent years, latex allergies have become much more predominant in health care provider offices, meaning people must be aware and knowledgeable about how their bodies react to such materials. Latex is derived from the Rubber Tree. 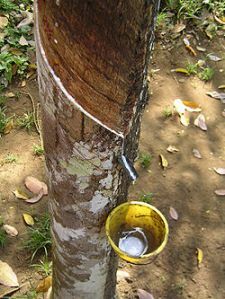 Natural rubber latex products (like powdered latex gloves) come from rubber trees located throughout South America and elsewhere. This naturally occurring product contains proteins which are the primary source of allergens. There are different types of adverse reactions that occur with latex gloves: the most common is irritant contact dermatitis, which is not an actual allergy, but a skin reaction to the detergent, additives or powders that cover most latex gloves (usually your skin will appear red, dry and cracked). If it is allergic contact dermatitis, you can get a skin rash after a few hours and up to 48 hours after contact. The non-contact exposure to airborne particles when removing the gloves can cause signs and symptoms similar to those of hay fever or asthma. An actual latex allergy is a systemic allergic reaction which is caused by IgE antibodies in the blood to the proteins in natural latex. The response is immediate, such as itching, redness, swelling, sneezing and wheezing; the most serious reactions can be a life threatening and result in anaphylactic shock. If you do have a latex allergy, be sure to communicate with your dental health provider, because there are alternatives. Because health care providers are repeatedly exposed to latex quite frequently, they are at a higher risk factor of developing latex allergies – as many as 17% of all health care providers are estimated to have latex allergies. Also, the allergy-causing proteins in latex are found in foods (such as avocado, banana, chestnut, kiwi and passion fruit) – so you might be allergic both latex and some related food. There is no cure for a latex allergy, although medications are available to reduce the symptoms of latex allergies like antihistamines. If a severe reaction occurs, you will need an emergency injection of adrenaline (epinephrine). For those prone to anaphylaxis, an epi-pen should be carried at all times. The best treatment is prevention, avoid all products that contain latex and ask for advise from your doctor who might be able to suggest ways you can avoid latex in your daily life. Keep identification on you that clearly alerts others of any allergies you have, choose alternative products, and inform your health care professional of any developments.